Upon arrival at Siem Reap airport, met and transferred direct to hotel for check in. In the afternoon visit Angkor National Museum and the famous temple Angkor Wat, a World Heritage Site since 1992. 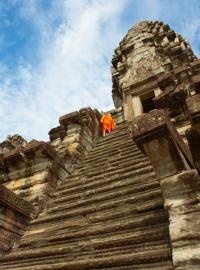 Then followed with the hilltop temple of Phnom Bakheng for a truly memorable sunset. Dinner and enjoy with Aspara Dance Show at local restaurant. Afternoon visit the unique interior brick sculptures of Prasat Kravan, Srah Srang ("The Royal Baths" was once used for ritual bathing), Banteay Kdei (surrounded by 4 concentric walls), Ta Keo, constructed in late 10th early 11th century C.E, the first temple to be constructed wholly of sandstone. At 7.30 am, embark to visit the largest community on the Tonle Sap Lake at Kampong Khleang. Depending on the time of year and lake water levels, we will approach Kampong Khleang by road or boat. Stroll through this undeveloped community, visiting local traders and the pagoda. Then it's time to take our places on our own motor-boat, to cruise along the estuary, passing unique tall stilt-houses and then onto the Tonle Sap Lake. Here we will see a whole floating village - including houses, a floating fish market and even a floating school. Lunch will be taken back in the village at the house of our boatman. Fresh fish from today's catch at the lake will be the main dish. We always have a vegetarian option though. Then, with just a pleasant one-hour drive through local countryside - we'll arrive at what many people say is the highlight of the tour; The incredible jungle temple of Beng Mealea. This largely unrestored temple is in much the same condition when it was re-discovered. It is a wonderfully atmospheric temple with ample shade, vegetation and individual opportunity to explore it's hidden treasures. Back to Siem Reap late afternoon, in time to catch another sunset from the roof terrace and bar of our hotel. Try a lychee martini while watching the sun set over the lush countryside. Transfer to the bus station for 5 to 6 hour bus drive to Phnom Penh. Upon arrival, met by the local guide and transferred to hotel for some refreshment. Today, enjoy a slight city tour to National Museum, build in 1917 and designed in Khmer style by famed French architect Georges Groslier & Ecole Des Arts. Then visit Royal Palace, built by King Norodom in 1866 on the site of the old town, Silver Pagoda, located within the grounds of the Royal Palace. End of the day, head to the riverfront, enjoy the view of the confluence of Mekong and Tonle Sap River. Visit the notorious Killing Fields " Choeung Ek" 15km southwest of Phnom Penh. This one is the site of brutal executions of more than 17,000 individuals, most of whom first suffered through interrogations, torture and deprivation in Toul Sleng Prison during Pol Pot regime (from 1975–1979). On the way back stop over at the handicraft shop, spa and vocational training restaurant. This place was created in 1996 by Pour un Sourire d’ Enfant (PSE) www.pse.asso.fr. to rescue Cambodian children. Then continue to Toul Sleng Genocide Museum - originally built as a secondary school named Tuol Svay Prey High School in 1960, during the reign of Preah Batnorodom Sihanouk. The Khmer Rouge converted this into a torture and interrogation centre to extract 'confessions' of anti-government sentiment. Visit Central Market (Phsar Thom Thmei), the distinctive art-deco styling of this market makes it stand out among the architecture of Phnom Penh, where you can shop for souvenirs, clothes, jewelry, silver products, etc. Then transfer to Phnom Penh Airport for departure flight to your next destination.